Nearly everyone in the U.S. seems to agree the nation's immigration polices and enforcement methods are broken. According to a recent New York Times/CBS News poll, 45% of those surveyed believe America's immigration policy needs some "fundamental changes" -- while 44% say it should be completely rebuilt. And nearly three-quarters of those polled agreed with the statement that "illegal immigrants do more to weaken the U.S. economy because they don't all pay taxes but can use public services." 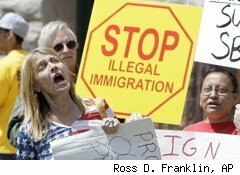 The Federation for American Immigration Reform (FAIR), which "seeks to improve border security, to stop illegal immigration, and to promote immigration levels consistent with the national interest", says undocumented immigrants impose a significant economic burden on local communities. FAIR estimates the current cost of illegal immigration on local community budgets for just three civic programs -- primary and secondary schools, medical emergency room services and incarceration -- comes to about $36 billion a year. "Because the burden is related to the low wages earned by this population and that is unlikely to change as long as the earnings do not rise more than inflation," says the organization's website, "any Congressional amnesty-type action that incorporates these foreign workers and allows or admits additional ones will not only perpetuate the fiscal burden, it will increase it." Immigrant amnesty is a hot-button topic these days. In 1986, President Ronald Reagan signed into law the Immigration Reform and Control Act (IRCA). That bill gave amnesty to many undocumented immigrants in the U.S., while making it illegal to knowingly hire or recruit illegals. Regina Germain, an adjunct professor at the University of Denver's Strum College of Law, was a law student when IRCA went into effect. It offered a quid pro quo, she says: "We'll legalize people who are already here.... I think three million people were legalized. And to prevent further people from coming...we'll require all employers to check employment authorization, and that way there will be no more illegal immigration." But nearly a quarter-century later, she says, "there are, by some estimates, 20 million undocumented people here [and] there wouldn't be 20 million people here if there weren't some way for them to work." Professor Germain understands the anger directed towards undocumented immigrants but points to certain realities. Removing that population would not only be very difficult, she warns, but would also have a major impact on the overall U.S. economy. "[These] people pay taxes here," she says, "and often their employers will deduct taxes from their pay that they can never recover through Social Security. So there's this idea out there that people aren't contributing. People think... the kids who are undocumented or their parents are undocumented, they're not paying for the school. And I'm thinking, they're paying property taxes because they pay rent or they own a home. They pay rent; the property owner uses a portion of that rent money to pay for his property taxes. So there's a perception that people aren't paying or sustaining themselves here, which I think is unfair and untrue." "I represent immigrants from all over the world," says Margaret Choi, partner with the Denver-based firm Lau & Choi P.C. "I think one thing that stands out is that they're very, very hardworking, very honest and want to have a good family." Choi says a growing number of her clients are undocumented immigrants who are seeking the American Dream but have been caught up in the nation's stricter, post-9/11 immigration laws. "I'm sure there are some bad apples," she says, "but the majority of them [are] very nice people, good people, good citizens." Choi says many of her clients are doing hard, unwanted, minimum-wage jobs at the bottom of the employment heap -- such as restaurant dishwasher, hotel maid, cleaners and janitors. "Also, these people, they're good consumers," she says. "They purchase a lot. They like to buy things, maybe send it back home or take it back home for their own use. But they spend a lot of money in the U.S."
Professor Germain blames media coverage on immigration issues for muddying some of those perceptions -- like the "anchor baby" idea, that an undocumented woman who gives birth in the U.S. is automatically allowed to stay. "I suppose you can call it an 'anchor baby' if you can wait 21 years, till the child can petition for you," she says wryly. "People make that misconception. As an attorney, a lot of people come to me and say: 'Can't I stay? I have a baby here.' No, the law doesn't give you the right to stay because you have a baby here. It almost seems like the press is fueling the opposite [idea], making people think that they can stay if they have a baby here when in reality they can't." She says the U.S. has a history of giving out conflicting messages to immigrants. "It's like our border has two signs," she says, "'Keep Out' and 'Help Wanted'. " "Several years ago, I took a tour of Ellis Island," she says. "And the people that give the tours say: 'Well, we'd like to tell you we were opening up our borders to the refugees of the world, to the downtrodden, but the fact is we needed workers and we brought these people in [to the U.S.] to work.' We still need those workers, it's just that we haven't recognized that fact in our law. We haven't enabled enough people to navigate the law to come here to work [legally], to do the jobs they're currently doing."